For three years a massive project has been going on at the Speed Art Museum, a transformation of the staid 1927 Neo-classical landmark into a new space that will be a center of education, exploration and appreciation of creativity in all its forms. Along with a modern addition that invites the community in, it is also an institution alive with ideas of reaching out. 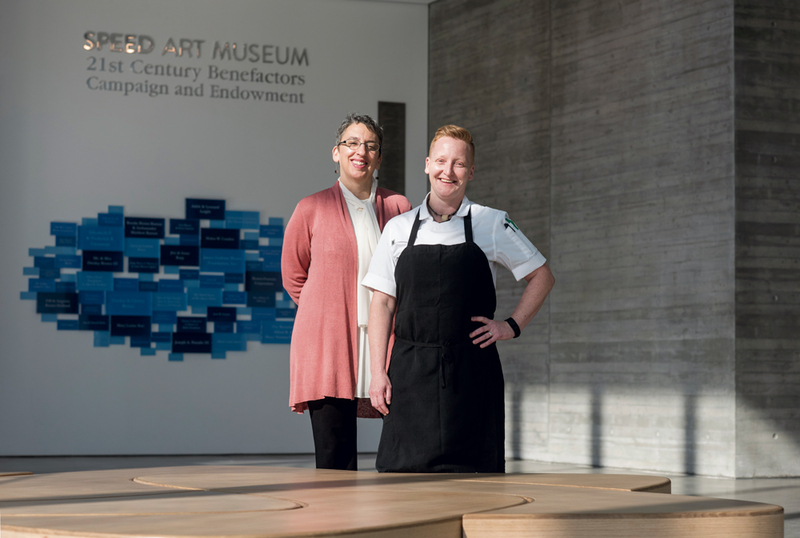 Included in the impressive new edifice at 2035 S. Third Street is a modern café, Wiltshire at the Speed, combining the creative vision of owner Susan Hershberg and Executive Chef Coby Ming to complement the museum’s mission to both invite and serve. 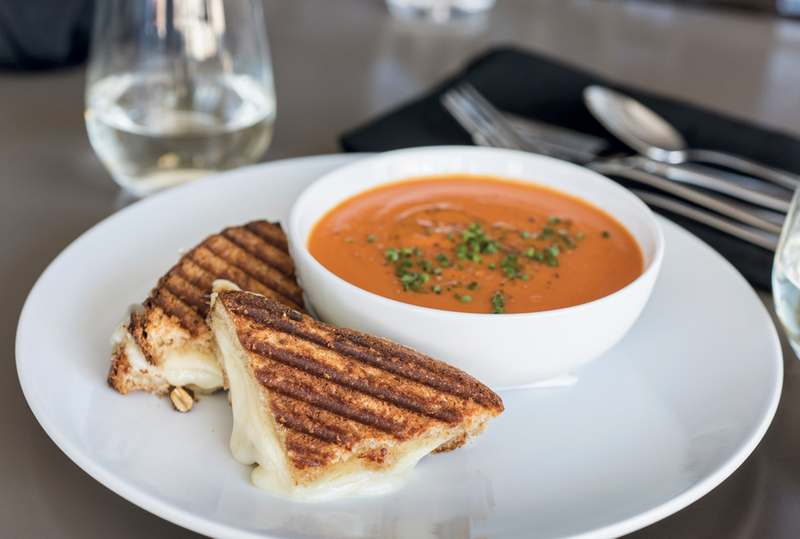 Hershberg has an impeccable reputation for fine food and service in Louisville, starting in 1989 with Wiltshire Pantry Catering. 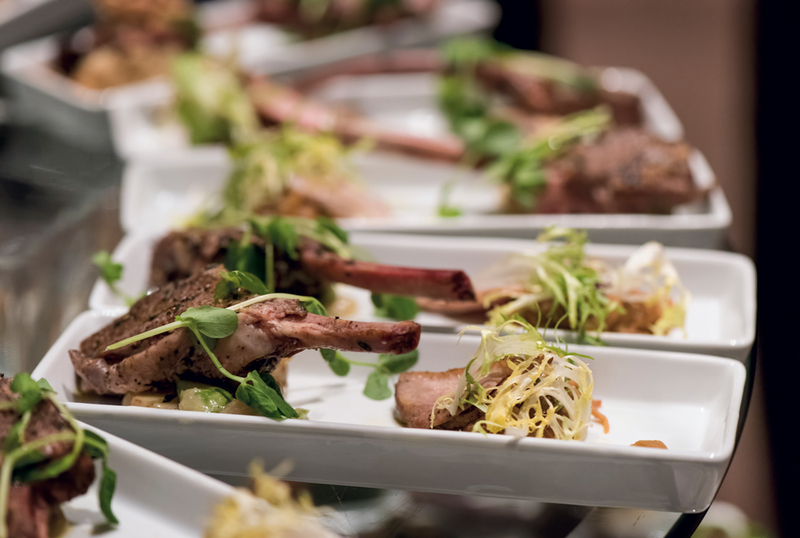 After over 20 years as a caterer, Hershberg entered the restaurant world with the 2009 opening of Wiltshire on Market, at 636 E. Market in Louisville’s NuLu neighborhood. 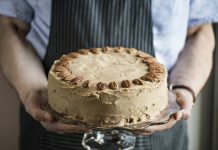 In 2013 she added the Wiltshire Pantry Bakery and Café at 901 Barret Avenue, and now with Wiltshire at the Speed she pushes forward both areas of her experience in a novel combination. The Speed Museum is a staggeringly new place of light and space with an inviting air surpassing any previously experienced in the older structure. Through a grand entrance of east-facing glass walls, visitors enter into a wide foyer bordered on one side by a large special events hall and on the other by a rising glass-walled atrium with broad floating staircases leading to new galleries on a second and third floor. Strolling on, visitors soon cross a glass bridge to enter the original galleries, now graced with expanded foyers, grand staircases and updated settings to display about 1,200 pieces of the museum’s collection (which includes about 14,000 items in total), nearly double the number that the former museum space could put on display. 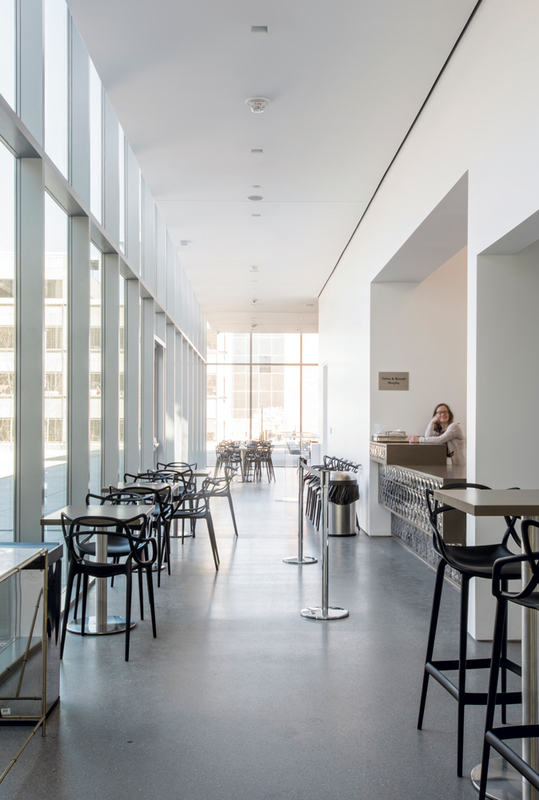 Continuing past the southern gallery of European art, turning east and descending into an expanded lower level, you come to the educational wing, a gallery dedicated to Kentucky art and a newly added 142-seat cinema which hosts a new, ambitious film program. Wiltshire at the Speed nestles into a clean, bright and inviting space entered off a large piazza by the museum’s main entrance or through the foyer of the new addition. 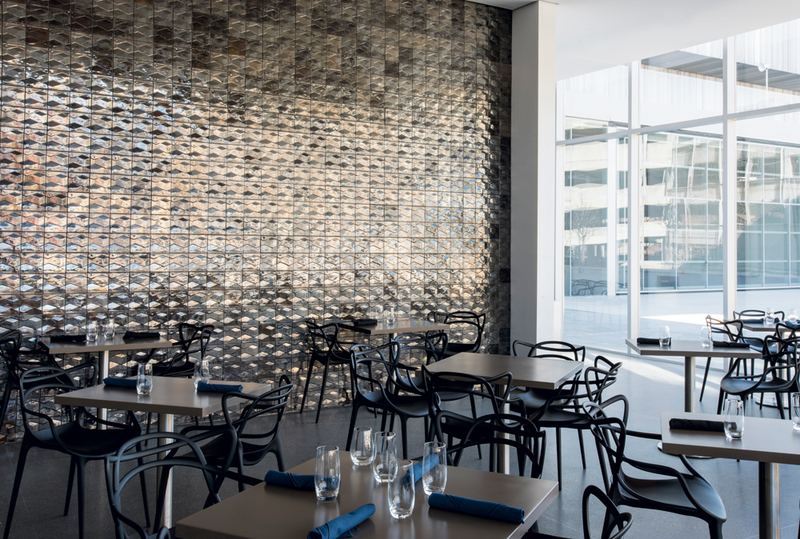 It is bounded on three sides by large expanses of glass looking out on the main entrance and patio, concrete walls left imprinted with the wood grain of construction forms and a beautiful floor-to-ceiling wall of dark iridescent custom tiles from Louisville Stoneware. There is seating for 58 inside and 24 outside, and for those who want something quick, there is a convenient “grab-and-go” counter with baked goods, snack boxes, cookies and other items, along with a coffee bar. 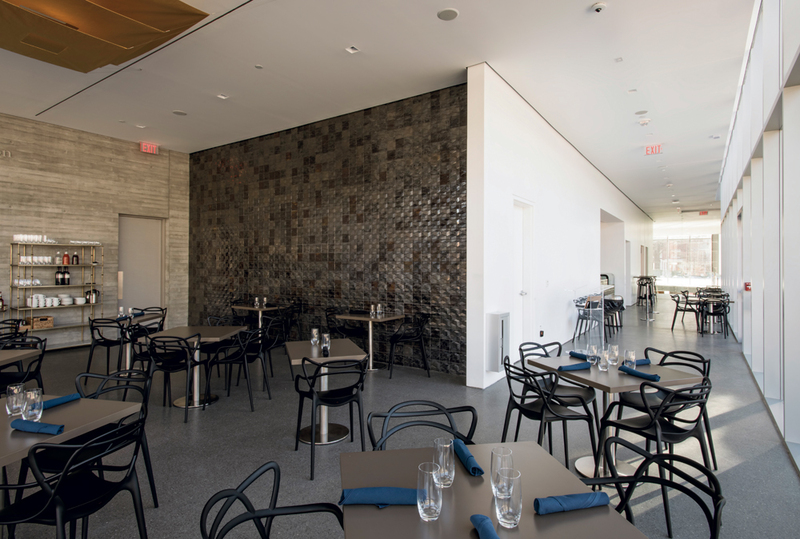 Hershberg’s vision for the museum café started to germinate four years ago when the renovation was about to begin. In her dealings with the committees overseeing the museum’s modernization, Hershberg laid out her ideas for a successful food operation. After a massive 90-page proposal and several years of negotiations, Hershberg stood her ground regarding the linking of both operations and ultimately got the nod. 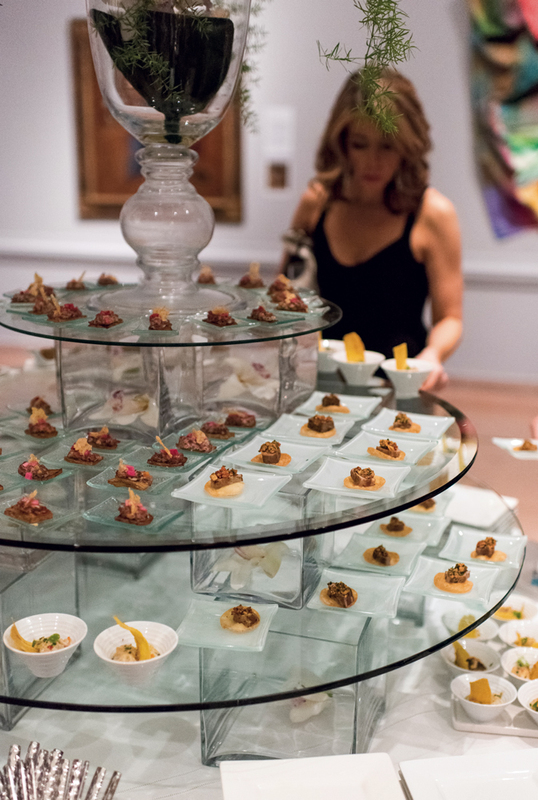 The event featured round glass food station towers with separate courses at each so attendees could enjoy an unhurried “progressive dinner” while they explored the new building and updated galleries. 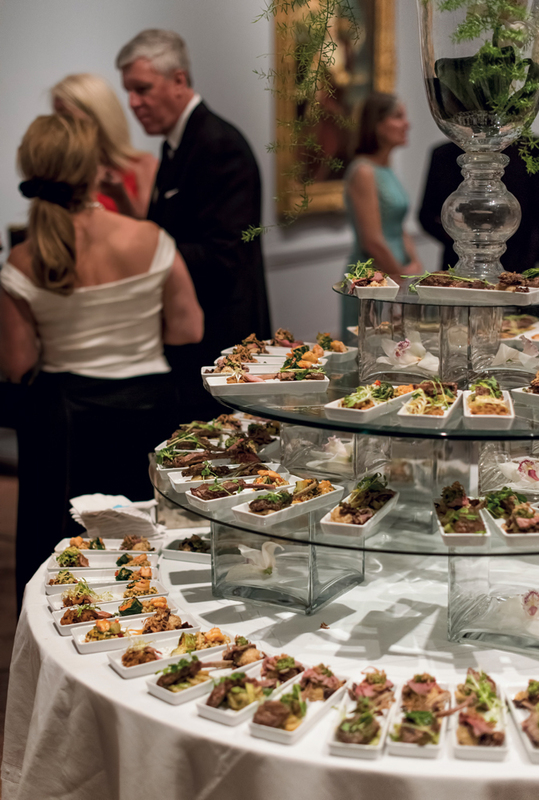 Each day of the following week they catered a series of special events for the local media, for museum volunteers and for community service organizations such as the Rotary Club. Their trial by fire culminated with a 30-hour open house marking the official opening to the public, who could buy food and drink as they attended lectures, films and guided tours. Hershberg exudes a calmness about such daunting projects because of the mutual confidence and trust she engenders with her staff. This is no more true than in her relationship with Chef Coby Ming, which goes back nearly 15 years. 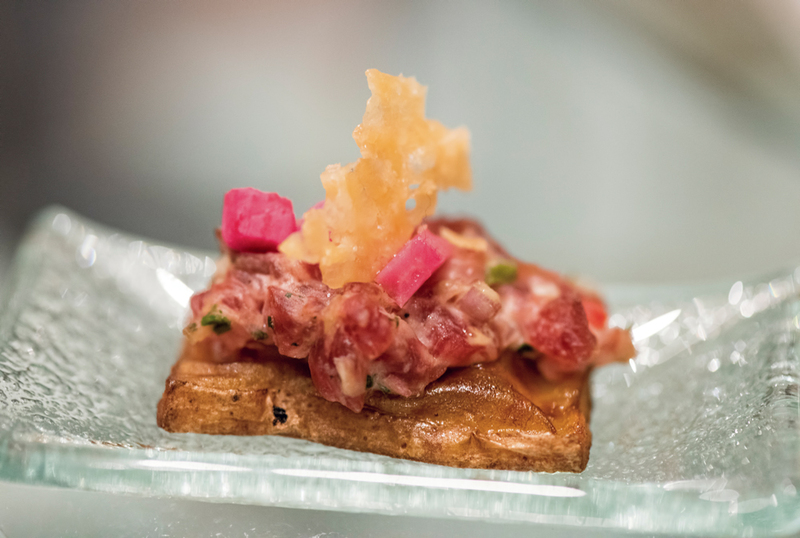 Executive Chef Coby Ming, pictured with Hawaiian Kajiki with saffron and cauliflower purée, freekeh tabouli salad and a watermelon-radish tzatziki. Ming’s youthfullness belie her years of experience. Growing up on Galveston Island, Texas, and in southwestern Louisiana, she smiles broadly when recalling being raised on spicy seafood and getting to help her mother and grandmother in the kitchen. She moved to Kentucky where her mother served a medical residency, but she had no sense of a career path until, as a freshman at the University of Kentucky, she met her dorm mate’s father, who had decided when he was just 14 years old that being a chef was the right thing for him. “I had no idea you could do that and pursue a major career,” Ming said. She soon transferred from UK, earned a degree from Sullivan University’s National Center for Hospitality Studies, and started working at such well-known local restaurants as Dietrich’s, 211 Clover Lane and Shariat’s, until becoming sous chef at Le Relais under Executive Chef Daniel Stage. “I was always determined not to pigeonhole myself, but learn a lot of styles. I always wanted to learn and to do. I wanted to have the skill to understand what people want and serve to satisfy it,” Ming said. While at Le Relais, Ming became acquainted with Hershberg and, as a chef, became interested in what Hershberg was doing at Wiltshire Pantry. “One can do a chicken dish 20 times in a night, but to do it for 400 is another matter,” Ming said. 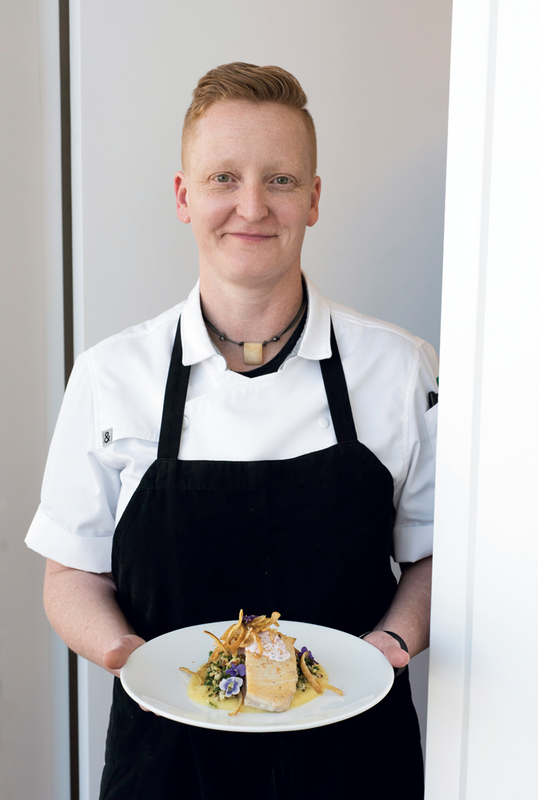 She joined Wiltshire in 2001 and had a 10-year tenure which included the 2005 move from St. Matthews to Wiltshire Pantry’s current location (with a café storefront) at Baxter and Breckenridge in the Highlands, becoming executive chef and opening Wiltshire on Market in 2008. During her tenure, Hershberg and Ming developed a good working relationship with Ivor Chodkowski, one of the local champions of the farm-to-table movement. 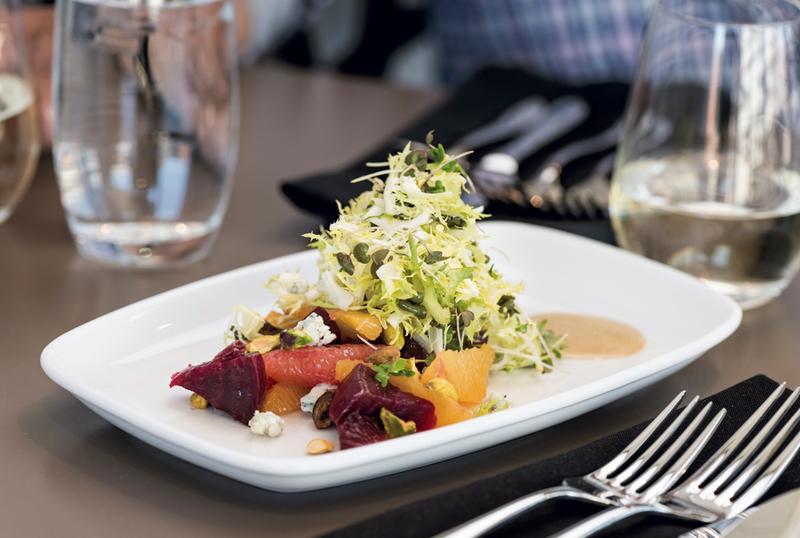 When Chodkowski and others sought to open Harvest, a restaurant dedicated to locally sourced food, she became executive chef and helped the restaurant grow to its current stature. Four years later in 2015, Hershberg asked Ming if she was up to another challenge. 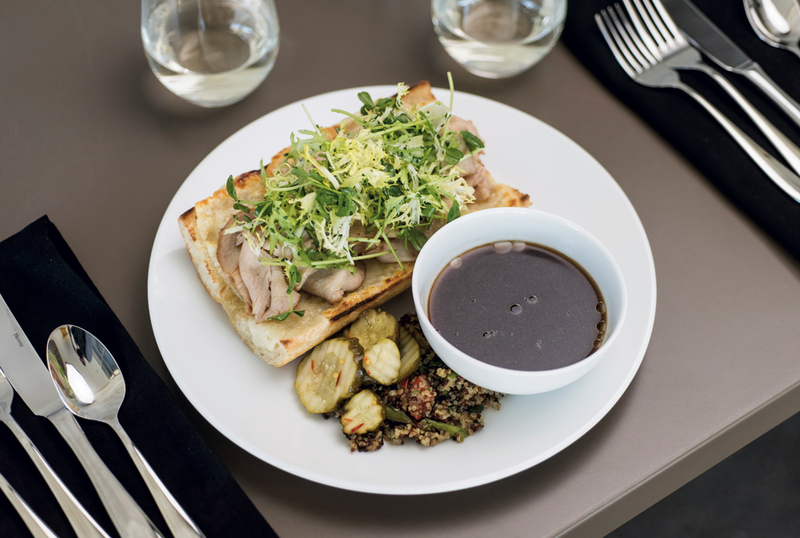 “There is an international trend in museum cafés to move away from fast casual to chef-driven concepts,” Ming said. “And the setting [at the renovated Speed] is an opportunity to think lighter, cleaner, fresher. 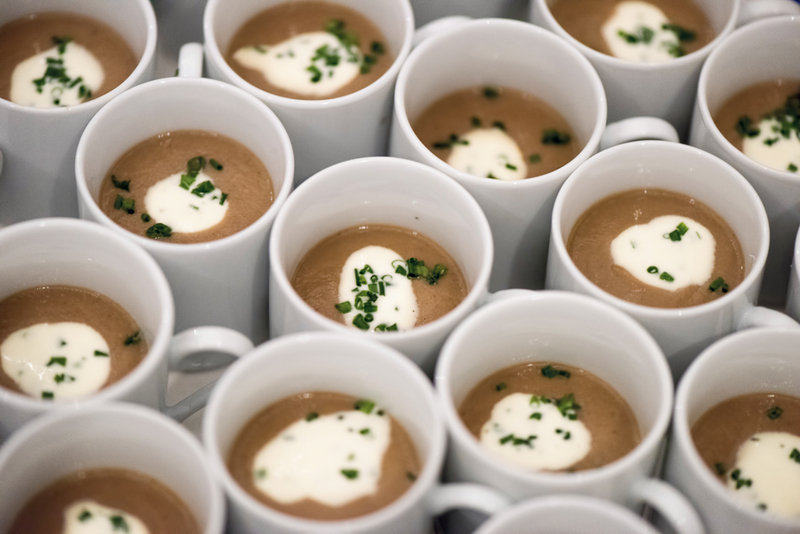 I can do a great beurre blanc, but I think there are better ways to get that [rich] flavor.” Rather than heavy sauces, Ming likes to use stock reductions and glazes to add flavor notes, producing delightful food that does not sit so heavily that diners want to take a nap after eating. 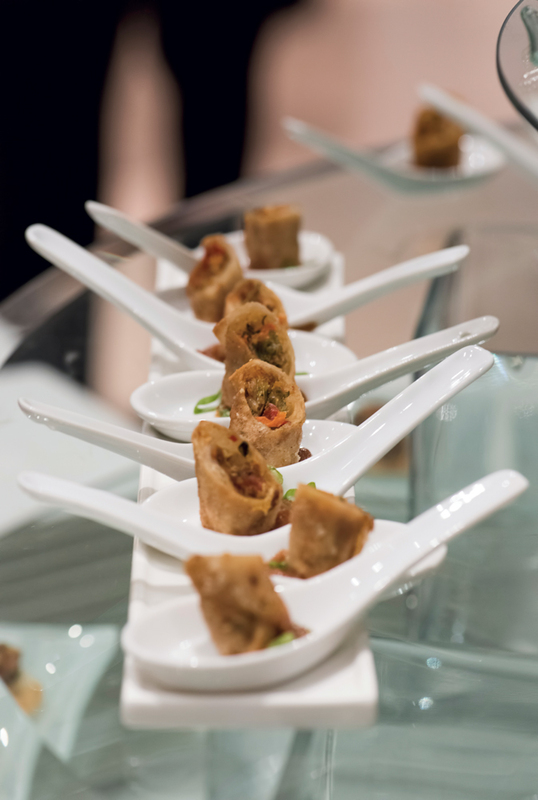 Wiltshire at the Speed is already collaborating with the weekend film program by offering simple but delicious snacks, like a cheese and charcuterie box, for attendees. 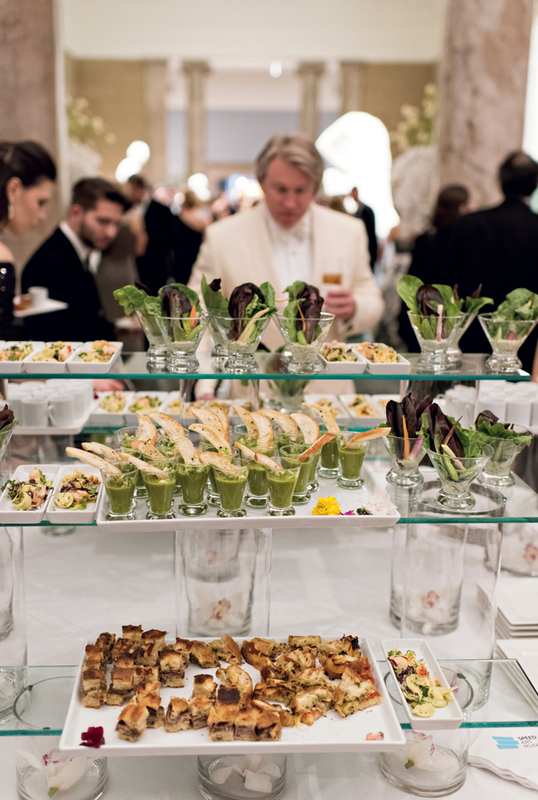 Later, film curator Dean Otto will have Wiltshire do themed dinners for special film events. Currently, Wiltshire’s Sunday brunch is an attractive option. Admission to the museum is free on Sundays, and so is parking in nearby lots across Third Street or behind the School of Music. Menu options in the café range from the simple – spiced granola and Greek yogurt with berries and honey, or chicken salad and sprouts with lemon-herb dressing on a croissant – to pecan wheat flapjacks with toasted pecans and warm maple syrup, or country ham with sunny-side up egg served with an aromatic grits congee, sugar snap beans, pickled kohlrabi, Napa cabbage and sambal. “Once I said ‘yes,’ it started to dawn on me that we have not just the café but this whole museum to work in,” Ming said. 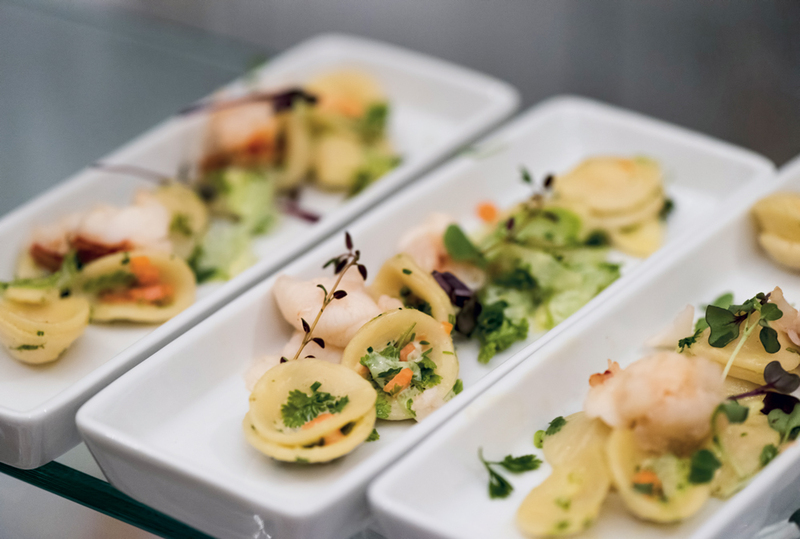 At the Speed, whether for special events or serving the public, Wiltshire’s 26-year record of excellence is poised for the challenge of great food and service in artful surroundings.